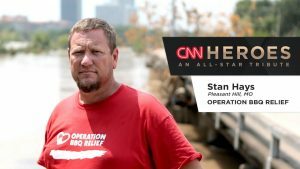 CNN and CNN Heroes have selected 10 well deserving people and charities for 2017, including Stan Hays, Co-Founder and CEO of Operation BBQ Relief. It is an honor for Operation BBQ Relief to be included in this awesome group of people and organizations. Operation BBQ Relief would like to recognize and thank our volunteers – your hard work, heart and passion to serve hot BBQ meals to survivors affected by disasters and first responders helped us earn this distinction. Thank you!